Mrs. Hufnagel offers her opinion of her new doctor, Dr. Mark Craig, and agrees to open heart surgery. 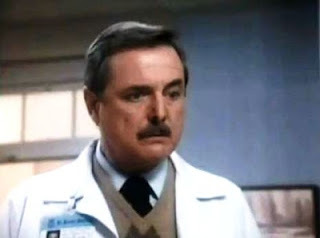 Dr. Mark Craig (William Daniels) and his family life. 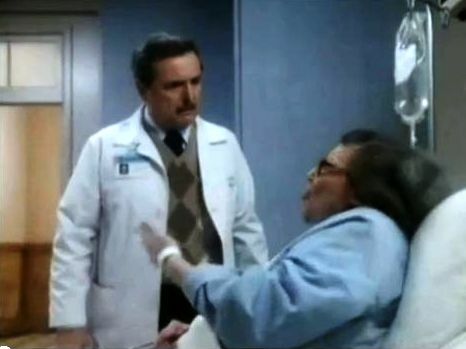 In the last post, I mentioned that the encounter between Mrs. Hufnagel (Florence Halop) and Dr. Donald Westphall (Ed Flanders) was a candidate for my favorite Hufnagel scene. One of the other top contenders is this one, where she gives the straight dope to Chief of Surgery and cardiac specialist, Dr. Mark Craig (William Daniels). As fans will remember, Dr. Craig is the most abrasive, arrogant, and short-tempered doctor at St. Eligius. He demands perfection from others, and does not suffer fools gladly. That's what makes it especially delicious when he meets his match in the small, elderly woman with an acid tongue. In this episode, "Amazing Face", Mrs. Hufnagel meets her new physician in the midst of her attempt to communicate with her dear departed love Murray Robbin in the afterlife through automatic writing. Dr. Craig tries to explain the results of her tests, but she starts in with the personal attacks right away. Once again, the St. Eligius grapevine has provided her with the latest goings-on. "What do you know about communicating with loved ones? Running your own brother out of town the way you did." Four episodes earlier, in "Saving Face", Mark's brother Billy attended the party for the Craigs' 30th anniversary, but Mark embarrassed him in front of everyone, and Billy left in the middle of the night. Craig tells her that she needs a coronary bypass, but she doesn't want to have surgery. "I've seen the scars you guys make. Andy Warhol might like his, but not this chick." Despite Craig's explanations, she's not interested, not even if he won the Cushing Left Anterior Descending Artery Award, which she discovered by snooping around his office. Craig asks her what she was doing in his office to see the plaster cast of his hands which serves as the trophy. Her response is one of the greatest Hufnagel lines: "I'm surprised they let you keep them, after Eve Leighton's heart went back to Nina." Dr. Craig reacts to a comment that landed below the belt. I love William Daniels's subtle eyebrow acting. Later, Craig complains to Westphall about him dumping "that Hufnagel creature" on him. I've left in the part where Mark comments on the attractiveness of Captain Gloria Neal (Betty White), the old friend of Donald's who made herself available to him a couple of times, most recently as a member of the White House staff in the previous episode, "Red, White, Black and Blue". We then see Mrs. Hufnagel pay a visit to the O.R., where she tells Dr. Craig that she'll go through with the surgery. She takes the initiative to check out a surgical procedure with her own eyes before experiencing it for herself, but gets the heave-ho from Dr. Victor Ehrlich (Ed Begley, Jr.). Knowing that Hufnagel will be going under the knife, budding surgeons Dr. Ehrlich and Dr. Jacqueline Wade (Sagan Lewis), who would normally be clamoring for the opportunity to assist Dr. Craig in surgery, do their best to make the case that the other is more deserving of the privilege. It's all for nothing, as Dr. Craig asks them both to participate. During the procedure, Victor complains that Jackie is getting to do everything at his expense. He's still sore about growing up as a middle child, and feels that favoritism is at play. Dr. Craig gets annoyed with Ehrlich (as he usually does), and in his distraction, he makes a cut that nicks the mitral papillary muscle, as Dr. Wade observes. Victor apologizes for his conduct, but gets in one last insensitive joke. After surgery, orderly Luther Hawkins (Eric Laneuville) helps Ehrlich and anesthesiologist Dr. Vijay Kochar (Kavi Raz) wheel an unconscious Hufnagel towards her post-op destination, and is delighted to learn that she will be unable to speak for at least a day. The Cushing Left Anterior Descending Artery Award is an ongoing joke throughout all six seasons of St. Elsewhere. He receives it in the fifth episode of the first season, "Samuels and the Kid", and it gets broken several times throughout the series. I will be tracing those on my next run through the show. It also serves as a crossover point for St. Elsewhere and Chicago Hope, on which Dr. Kathryn Austin (Christine Lahti) won the same award, which is fictional. This page from Thom Holbrook's Crossover and Spinoff Pages tells the story. 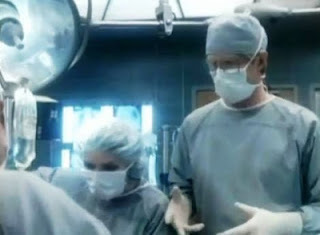 The episode titles with the word 'Face' in them are references to the continuing story where plastic surgeon Dr. Bobby Caldwell (Mark Harmon) performs radical surgery on facial fibromatosis patient Andrea Fordham (Ann Hearn), who now must adjust to life as a non-disfigured person.